Despite his defeat and reform last time, King Bomber could not accept the peaceful life, and has returned to his malicious ways. Not only has he called upon his armies to rise across the planet, but he's taken over the United Nations bulding! 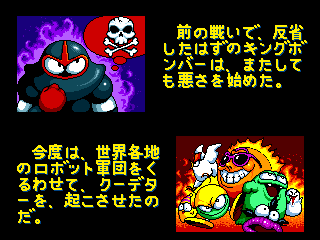 The Bomberman brothers set out on a globe-trotting quest to end his villainous antics. Irem returns with a follow-up to their arcade instalment, just as fast-paced and kooky-looking as ever. It follows much the same formula - defeat enemies to clear the stage, face a boss at the end of each world - but introduces more enemies, new power-ups, and enhanced 4-player support. 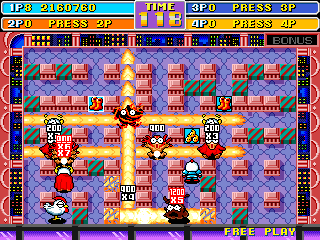 All four players can now work together in the Normal Game, or duke it out in the Vs. Super Game! 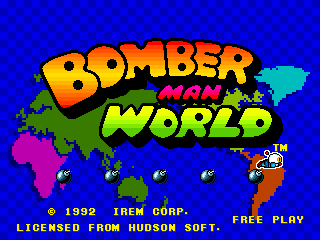 Not to be confused with the 1998 Bomberman World for PlayStation. If you're looking for the one with the prerendered graphics, Earth Bomber and the 5-player battle mode, then that game is what you want.